Ag Progress Days will feature an outstanding lineup of crop management, wildlife and conservation exhibits and demonstrations. UNIVERSITY PARK — From educational displays about conservation and sustainability efforts to the signature hay show, there will be a lot to see and learn in and around the J.D. Harrington Crops, Soils and Conservation Building during Penn State's Ag Progress Days, Tuesday, Aug. 14, through Thursday, Aug. 16. "As always, we have an outstanding lineup of crop management, wildlife and conservation exhibits and demonstrations planned," said Jesse Darlington, Ag Progress Days manager. "Of course, one of the highlights is the annual hay competition, which is a great place to see some of the best hay the state has to offer." The 2018 Pennsylvania Hay Show, sponsored by the Pennsylvania Forage and Grassland Council, will be held in the Harrington Building, at the end of East Fifth Street, from 9 a.m. to 4 p.m. daily. Hay entries should be dropped off at the special hay sample drop-off point located along the east entrance to Ag Progress Days or at the Harrington Building. Deadline for sample delivery is 10 a.m. Tuesday, Aug. 14. 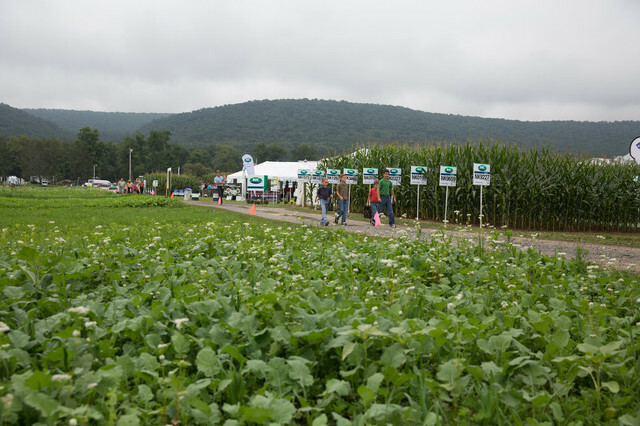 Specialists from Penn State and other organizations also will be on hand during the three-day expo to answer questions about crop production, weed identification and biofuel feedstocks. Visitors can ask questions about crop and nutrient management, no-till practices, organic farming and sustainable agriculture — and even bring a weed for experts to identify. Outside the Harrington Building, the Conservation Exhibit Area will feature displays on managing farmland to promote beneficial insects that are natural enemies of crop pests and weeds, solar-powered livestock watering systems, cover crop varieties and managing soil health. In addition, crop and conservation topics will be featured in other areas of the Ag Progress Days site, including demonstrations on corn chopping and animal composting, and a cover crop grazing exhibit featuring cattle. Tours focused on managing deer and other wildlife as part of a quality deer management system will take place daily at 9:30 a.m. and 12:30 p.m., with an additional tour Wednesday, Aug. 15 at 3:30 p.m. Tours will leave from the corn crib at the top of Main Street. Last, but not least, A-Maze-N-Corn — a family favorite since 2000 — gives children and adults the chance to wander a giant corn maze, which is stroller- and wheelchair-accessible. The popular destination is adjacent to the Harrington Building.